A fabulous oil for dry, damaged & aging skin, skin inflammations, rashes, diaper irritations, and other skin disorders. Excellent for wound healing, burns, itching & eczema. 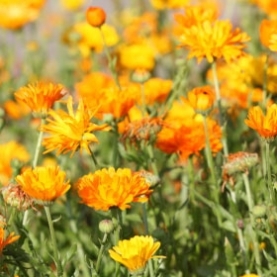 We infuse the Organic Calendula flowers in Organic Olive Oil here at Stillpoint Aromatics in Sedona, AZ.